A few weeks ago Art & Creativity for Healing held their annual Palette of Colors Fundraiser and auction. With the economy being in the state that it is …fundraising can be a tricky feat. This year AcH decided to shake things up a bit and hold a FUN raiser. Many new bowling venues have opened across the country and Anaheim 300 recently opened in Orange County. We had the facility from 6-10pm. Ticket prices included shoes, balls, as much bowling as you could muster, pool, gourmet hamburgers, wine, beer, soft drinks and dessert. There were so many fun baskets to bid on during the silent auction, beautiful artwork vacations and a puppy. We shared 2 lanes with 4 other couples and we had a great time. We won a beach portrait sitting – which I have wanted for quite some time. I lost out on the Tiffany raffle prizes this year although I can’t complain as I have won the raffle twice before… a beautiful lattice glass platter and a sterling silver bracelet. We were all taking turns bowling, a few frames at a time and we were not paying attention to our particular turn to bowl. Therefore I was VERY surprised to have my name called out for the “lowest” bowling score. Not that I could not have done it on my own, but I guess I was hoping if I had help it would have been to NOT win the title! I received a lovely gold and bejeweled bowling pin to commemorate my achievement or lack thereof!! After all was said and done Art and Creativity raised over $36,000.00 to fund their programs. The newest, Camp Pendleton programs are creating a lot of interest and are helping so many children and families. This is the collage piece that I donated this year. Laurie asked for something with “hope” as many of us can use a bit of hope this year. 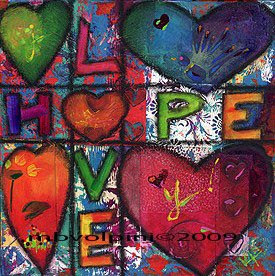 The couple that purchased “Hope, Love, Joy” have an outstanding collection of art. I am honored to become a part of their collection.